Daria Martin has won the 2018 Film London Jarman Award, it was announced this evening at a special event at London’s Barbican Centre. Daria Martin works across moving image and performance. Her enigmatic films mix the naturalistic with the surreal, creating multisensory spaces of the imagination. Her subject matter has ranged from her grandmother’s dream diaries to working with robots, choreographers and card magic. Her works are beautifully composed with an ethereal quality and an aesthetic that moves from cinema to 1960s instructional film. She has frequently worked in collaboration with scientists and has twice won Wellcome Trust awards. In her 2017 work A Hunger Artist, Martin retells Kafka’s 1922 short story. Set in a fantastical Victorian fairground it is a macabre tale of a sideshow artist who joins the circus, and having performed for unappreciative and doubtful spectators, ends up dying neglected. Her work At The Threshold (2014 – 2015) is one of a series of films that explores the rare condition of mirror-touch synaesthesia. People with this neurological condition feel a palpable sensation of touch on their own bodies when they see another person, or even an object, being touched. 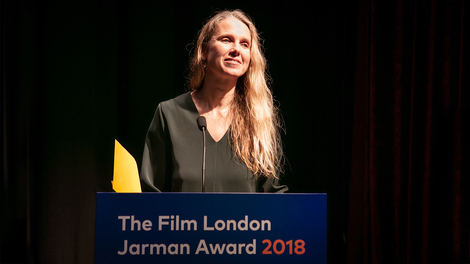 The Jarman Award, established in 2008, celebrates the diversity and creativity of artists working in film today, and is run in partnership with Whitechapel Gallery, Genesis Cinema and Channel 4. Nominated by experts across the UK film and contemporary art sectors, the Jury who selected this year’s shortlist are: Andrea Lissoni, Senior Curator, International Art (Film), Tate Modern and Film London Board Member; Catherine Bray, Editor, Random Acts, Channel 4; Iwona Blazwick OBE, Director, Whitechapel Gallery; Melanie Manchot, Artist; Skinder Hundal, Chief Executive, New Art Exchange, Nottingham and Tyrone Walker-Hebborn, Director, Genesis Cinema.